Six months ago, all the beloved characters on a beloved television show were taken captive, lined up on their knees, and then one of them—who could it be? !—was savagely murdered by the show’s savage villain. Viewers were not told which of their beloved characters was savagely murdered. For that, they’d have to tune into the next episode, six months later. TV critics were generally appalled. Cliffhangers are a staple of serialized television, but this one was different. This one was so gimmicky, so cynical, that some critics argued it abused the show’s very loyal fans. There was no legitimate storytelling reason for the mystery, they said, it was included solely to force fans to wait half a year to find out the answer. Fans were upset, too. They took to social media to voice their disillusionment, some of them vowing to never watch the show again. “This was the last straw for me,” one posted on Reddit. “I hate you,” one tweeted at the show’s official Twitter account. With fans and critics in total alignment, it looked as though this hit show was finally doomed to fail. But it was not so. For there was a massive bailout, in the form of TV ratings. Despite fans’ pledge to quit the show, even more people watched the next episode six months later. It was as if the controversy surrounding the asinine cliffhanger had, somehow, made this unstoppable juggernaut even bigger. 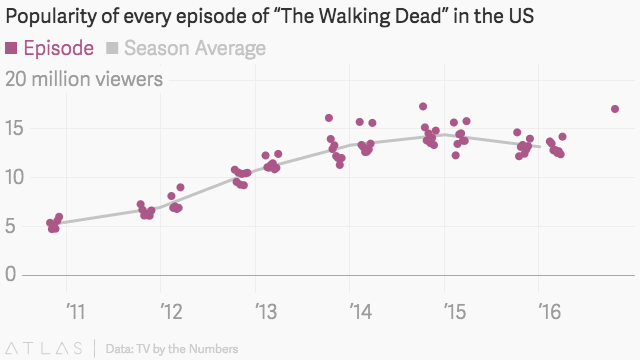 And so goes the legend of The Walking Dead, a show that insulted its audience and then gained even more viewers. Sunday’s (Oct. 23) seventh season premiere—the episode that answered April’s cliffhanger—was watched by 17 million people, up 20% from the episode before. It was the highest rated installment of The Walking Dead in two years, and the second most ever. Obviously, no one who said they would stop watching the show actually did. Before Sunday’s episode, ratings for The Walking Dead were trending down for the first time since the show launched in 2010. It’s possible, and perhaps likely, that ratings will begin trickling down again following this season’s premiere. But it’s clear that the zombie show is now so popular that the zeitgeist will not allow it to fail, no matter how hard it tries. In this regard, The Walking Dead stands alone. As the biggest show on a cable network (AMC), it’s more beholden to ratings than if it were on a streaming service, like Netlix, or a pay-TV channel, like HBO. And it’s based on Robert Kirkman’s never-ending comic book series—meaning as long as he’s churning those out, AMC will churn out more episodes. From its rabid fans, to its stellar ratings, to its source material, to its financial importance, The Walking Dead may never die. Still, AMC would be wise to start planning its end game. Other hits will come along—it’s the network that gave us Mad Men and Breaking Bad, after all. The company can find ways to replace the revenue lost by ending the show. What it cannot replace, however, is the show’s legacy. If it were to end soon, it’d be known as one of the most popular shows of all time, one that reintroduced a genre into the heart of American entertainment and pushed the limits of what’s possible on cable TV. But if it’s allowed to persist, that won’t be its legacy. Instead, it will be remembered as an institution that went on forever, cheated the public, and kept raking in profits at the expense of all that is good. You know, like one of the big banks. And by the way, the show killed off two characters, not one. Twist!